My hot take on who won the Pence vs. Kaine debate is that Tim Kaine won simply because he did his job being a proxy debater for Hillary Clinton. Mike Pence lost because he pretty successfully pitched the 2016 Republican Party agenda — a good bit of which his running mate doesn’t support — instead of being a proxy for Donald Trump. Pence did exactly what he knows how to do: argue for himself. Had this been Pence vs Kaine for a Senate seat, Pence wins because of that. But it’s not. 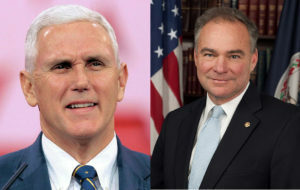 Pence did zero damage to Hillary Clinton and Kaine, by repeating a lot of the unpopular and contradictory things Trump has said, reminded people they aren’t voting for Mike Pence, they’re voting for Trump. And Pence just didn’t want to do that.